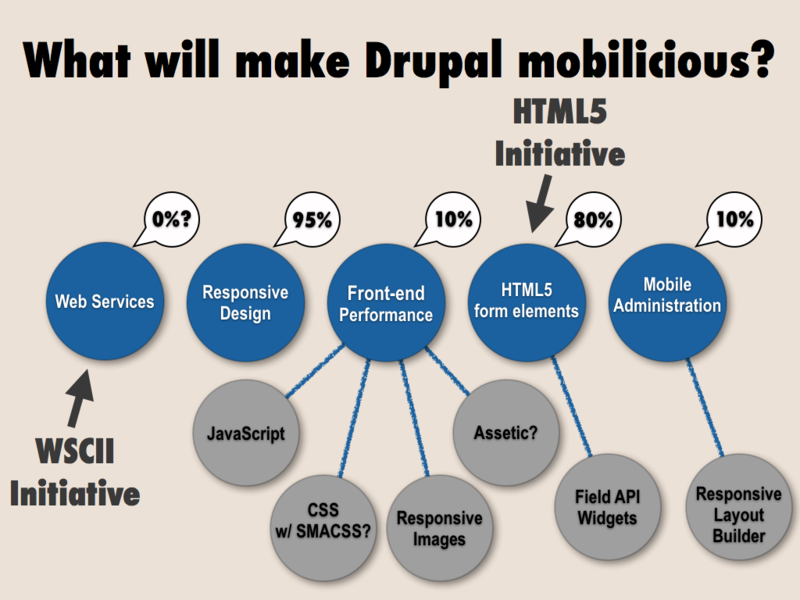 In addition, being able to edit and draft Drupal content while waiting in line or or on the train (all the typical mobile locations) would be a big boon to productivity when administering a site. Lewis Nyman’s early passion for this subject convinced me of how important mobile administration is to Drupal 8’s success. It’s why I made sure it was in the top goals of the Mobile Initiative. And now Acquia has taken up the cause with their Spark project; originally proposed as a Drupal 7 project, Spark received such wide praise during Drupalcon Munich, that the Acquia team has decided to first work on a Drupal 8 version before backporting to D7. But only if the Drupal community helps with the work! Jesse Beach put up a demo site showing the current state of the work. (There's also a video showing possible admin navigation interactions a few comments earlier.) She’s currently looking for people to work on the code; just create an issue in the Git sandbox and Jesse can give you commit access. Assetic is a Symfony component providing pluggable processing of JS and CSS, making coffescript, Uglifyjs and custom aggregation groups easy and painless. Drupal 7’s current aggregation is a decent, general-purpose tool, but to achieve optimal front-end performance, engineers often have to work around the system and create custom solutions. A pluggable Assetic solution would make it really easy to extend and tweak the existing system instead of re-writing it. Much of the front-end performance work we have planned can be continued through feature freeze, but this clearly falls in the "new feature" category, so we need to work on it now. Responsive images is a serious front-end performance problem that the entire web industry is struggling with. Fortunately, the Drupal community has been very active in the proposed <picture> HTML element and we’ve made a commitment to provide a reasonable forward-looking solution to this thorny problem. The current work is being actively worked on by Peter Droogmans (attiks). We’ve recently decided to break this task into several sub-tasks, listed below by importance. Drupal 8 will need a way to configure the different sizes used for a responsive image. And, while a UI for setting breakpoints for the site would be mighty useful, and API for setting breakpoints is needed first. After feature freeze, the Mobile Initiative will be pivoting to focus solely on front-end performance and improving the features that make it into Drupal 8 before December 1. This includes improving our already-responsive themes and continuing to add to our Drupal 7 Mobile Guide.